Eric J. Barron began his tenure as the 18th president of The Pennsylvania State University on May 12, 2014. 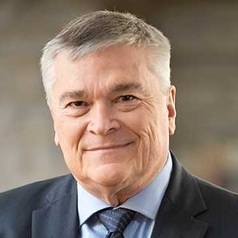 Previously, Barron served as president of Florida State. He has nearly 35 years of leadership experience in academic administration, education, research and public service, as well as a track record as a talented manager of fiscal policy within large and complex institutions. Barron spent 20 years of his career at Penn State, serving as dean of the College of Earth and Mineral Sciences from 2002 to 2006, and as founding director of the Earth System Science Center, one of the first major initiatives focused on the total study of Earth as a system. In 1999, he was named Distinguished Professor of Geosciences at Penn State. An accomplished scientist with a long background in atmospheric research, Barron previously served as director of the National Center for Atmospheric Research (NCAR) and as dean of the Jackson School of Geosciences at the University of Texas at Austin. Over the decades, Dr. Barron has lent his significant expertise in the areas of atmospheric science and the geosciences to many national committees and federal agencies, including nearly 20 years of service as the chair of multiple National Research Council committees and boards.